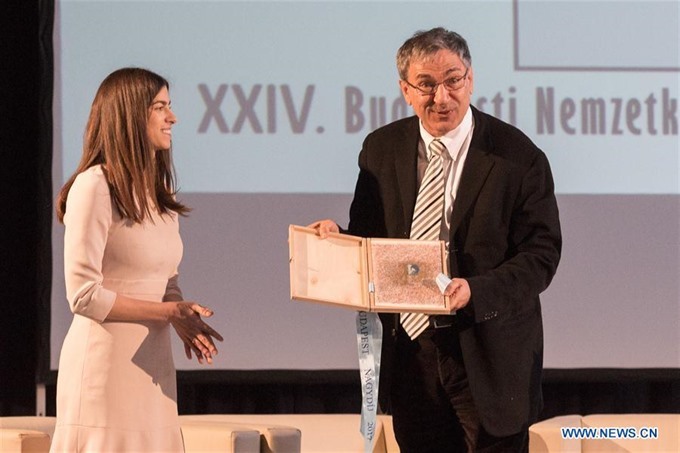 BUDAPEST — The 24th Budapest International Book Festival was inaugurated on Thursday with the attribution of the Budapest Grand Prize to Turkish winner of Nobel Prize in Literature Orhan Pamuk. "I write novels so that I can sympathise and understand the souls of people who think in completely different ways from mine," Pamuk said, when receiving the award. Pamuk is the honourary guest of the festival this year. "Everywhere in the world, people want to be modern and state-of-the-art, but they also want to keep their identity and heritage, which gives birth to many contradiction, and I am a man who loves these paradoxes," the author added. The prize was given to him by deputy mayor of Budapest, Alexandra Szalay-Bobrovniczky, and Andras Sandor Kocsis, president of the Association of Hungarian Publishers’ and Booksellers’ Association. "The more than 20 years of history of the Budapest International Festival, which became one of the most important book festival of the region, proves that it is good to read, and that printed words have no alternatives," Hungarian State Minister for Culture and Science Diplomacy Istvan Ijgyarto told the opening ceremony. Besides Pamuk, the four countries of Visegrad, the Czech Republic, Slovakia, Poland and Hungary were also at the center of the book festival. "The spirit, the way of life, the community of values and destiny of Central Europe binds the Visegrad countries, despite all of the existing conflicts of interests and the harms inflected upon each other over the course of history," Ijgyarto added. "Our literatures are unique, but they do influence and draw from one another," he also said. Besides authors, the Visegrad countries were also represented by many translators and publishers.